Gifts for Twins and More! We specialize in fun t-shirts and gifts for twins, triplets and other multiples as well as their parents, grandparents and other family members! As parents of twins, we've found it’s important to have the right stuff to make life a little easier, and that includes gifts that our twins can give their grandparents, aunts, uncles and each other. Quality has always been an essential requirement of our t-shirts, and we’ve included the same quality requirement on all of the products that we offer. We have a variety of twin gifts, pregnancy essentials, twin breast feeding pillows, toys for multiples, bedding, gift baskets with more to come. 20% Off Two! Buying two of everything is pretty normal for parents of twins. Right now save 20% when you buy two of any our t-shirts! Hooded Baby Towels are a great baby shower gift that will be loved for years to come. These oversized, 100% cotton, hooded towels come in eight fun designs and are perfect for swimming lessons, the pool, and the beach. Mother of twins manage to get it all done on half the sleep – but they also get twice the hugs and kisses! This is the perfect shirt for every mother of twins, especially those moms of twins in the newborn to preschool stages! Triplets bring three times the fun, and three times the love! The “I heart/heart/heart Triplets” shirt is a unique way to announce your pride and devotion to your three little treasures. A must have Father of Twins shirt, our Real Men Have Twins t-shirt tops our customer’s favorite list of twin dad gifts for birthdays, Father’s Day, Christmas –any occasion! There is truth in advertising! 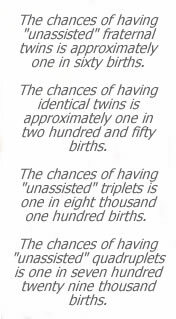 Multiple Treasures is a proud supporter of the Twin to Twin Transfusion Syndrome Foundation. One dollar of each shirt purchase will be donated to this outstanding charity. Thank you for making this possible.